Our teardrop trailer, fondly known as The Pod, had birch plywood sides. They were beautiful until two years in the hot and dry Arizona desert caused some unsightly wrinkles and cracks in her skin. 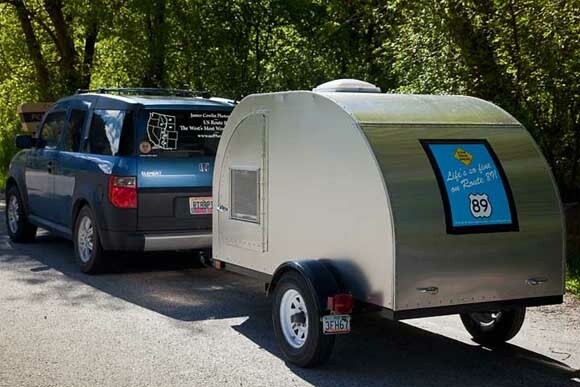 We talked to her maker, Preston, in Logan, Utah, at Teardrop 72 about the problem and he immediately offered to cover her sides in aluminum, to match her top. Friends had ordered a trailer from Teardrop 72 with aluminum sides and were very pleased with it. So, we dropped the Pod off with Preston in Logan for several days, while he operated on her. We stayed at our favorite bed and breakfast, Parrish Place, in Salt Lake, while the procedure was being done. Preston was kind enough to keep us updated daily on his progress. With heightened nerves, we arrived to pick up our face-lifted teardrop, worried that we wouldn’t like the new look. But, she looked just great, smooth and fresh. Now she can be exposed to hot sun and dry air and will remain unblemished. The nice thing is that she still sports a beautiful wood interior, a nice warm contrast to the more streamlined exterior look. With many thanks to Preston for his generous, beautifully crafted redo, we headed north.